Thousands of sequins shimmer and shine on Alicia’s glamorous bodice, which is beautifully tailored with a v-neck and small short sleeves. A meticulously pleated chiffon waistband perfectly compliments the tailored design, while a flowing chiffon skirt creates a glamorous and feminine silhouette. Alicia is fully lined in matching satin and features an invisible zipper on the side of the bodice. 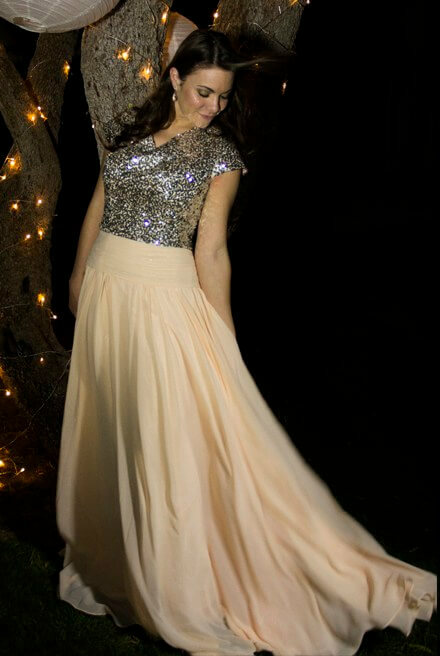 Shown with a Silver sequin bodice and Vanilla skirt, Alicia is available in hundreds of different color combinations! Virtuous Prom went above and beyond anything that could've ever been expected of them. With two weeks until my brother-in-law's wedding, I came across this dress and fell in love. It was beautiful and modest and reasonably priced, something that I have not been able to find anywhere else after months of searching. Within minutes of sending my email, they called me and we were discussing details. Megan was absolutely phenomenal. She was so thoughtful, detail oriented, and kind. Without her, I feel confident that this would not have worked out as well as it did. She made me feel so valued and important as a customer and a person. The dress was stunning. It was everything I had hoped for. And after having two babies, it felt unbelievably wonderful to feel beautiful again. I will use them for every formal dress I need from now on.